The great internet purge of cool small-time music publishing enterprises continues. Couch by Couchwest is the latest victim, announcing earlier this week that it is calling it quits. Founded nearly six years ago to be an alternative to South by Southwest held every mid March in Austin, CXCW took the performers who couldn’t attend the event, and matched them up with patrons who couldn’t attend the event, and tried to offer the next best thing to being there. Artists would make dedicated videos for the CXCW online “festival,” and through a loosly-organized group of Twitter users and couchbycouchwest.com, they would put everyone in one virtual place. It was a genius idea really. It embodied the “do something” spirit. Each year during SXSW, Twitter would be flooded with folks proclaiming how much fun they were having, and how much great music they were seeing, and everyone else felt left out. So instead of complaining about it, a few enterprising folks created an alternative that everyone could participate in. Even though some criticized that CXCW was encouraging music fans to stay home instead of venturing out to support artists in local venues, all one had to do was attend the actual SXSW event to know new alternatives needed to be hatched. SXSW has become so bloated and disorganized, it’s a difficult to sometimes impossible proposition for many patrons and performers to attend. But just like SXSW, quality control became an issue with the CXCW participants, and the slow erosion of Twitter has also made it tough to keep folks interested. Though reports of Twitter’s death have been greatly exaggerated, it’s definitely telling of where the social network is headed that it was cited by CXCW specifically as one of the reasons it’s shutting down its official apparatus. 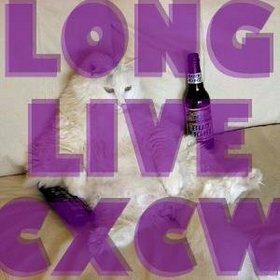 Many of the blogs that would piggy back or bolster CXCW every March have also closed their doors, making for an even smaller support structure for the event. And as CXCW says in coining the phrase “generica” (which SCM will be borrowing in the future), the crush of artists looking for attention is making it harder and harder for the cream to rise to the top. Each time yet another blog or organization like CXCW shutters, you feel like you’ve just lost a close friend to a tragedy. You get a lump in your stomach. All the good times they gave to you, and you know you can never replace that. What could have you done to help support them better? What kind of world would let this happen? But just because the CXCW organizers are no longer working in an official capacity, they’re encouraging folks to continue on the tradition without them.